Murakami House (村上家) is one of Gassho Style House of Gokayama. It was built in Tensho era (1573 to 1591), and designated as a National Important Cultural Property. It is opened to the public as a folkcraft museum. About 1,000 folkcrafts and tools for making gunpowders are displayed here. When the group tour arrives, they have special demonstration of Traditional song and dance called "Kokiriko-bushi." Admission: 300 yen, 150 for kids. ... is one of popular traditional dance around Gokayama area. Kokiriko is a small bamboo stick (23 cm) which is used for making rhythm beat for the song and dance. Also, Dancers uses Sasara, which is common musical instrument for street performers in Edo period. Gokayama is also famous for its various kinds of local music because there was no text in this area for long time, and all the songs were carried from generation to generation by singing. The songs are the historical records for people in Gokayama. Gassho literary means pray with both hands by fitting palms . Because the triangle figure of the house looks the similar to Gassho, it is named Gassho Style Houses. The roof has an angle of 60 degree to drop snows. It is made from thatching, and replaced every 20 to 30 years. The house use no metals, such as nails, and all made by ropes. 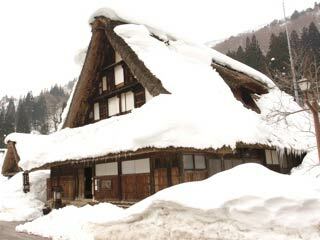 It is very strong structure against snow, therefore most of Northern Japan, especially the area of Snow Countries, built Gassho Style Houses. The room layout of Gassho Houses is the same. The first floor is divided by 8, and put 2 together to make kitchen and entrance. Four other rooms are used for living space. When they repatch the roof, all people in town help together. This work is called "Yui."